Dreams are gateways to the soul. 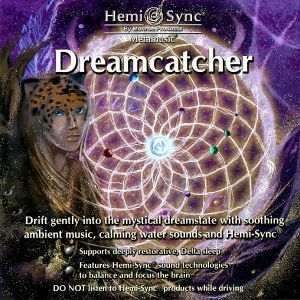 Drift gently into the mystical dreamstate with soothing ambient music, calming water sounds and Hemi-Sync®. Don Peyote and Naasko bring their shamanic influence to bear in this versatile composition. Dreamcatcher supports deep, restorative sleep when used in continuous play. It may also be used for massage therapy, subtle energy healing work or for powerful meditations in the borderland sleep state. Instruments featured: harmonic chords, drones, synthesizer, and field recordings of water sounds and whale calls. Restorative sleep and dreams, massage therapy, meditation, healing treatments with subtle energy, shamanic music themes.